ikat bag: Toadstool House Pattern! 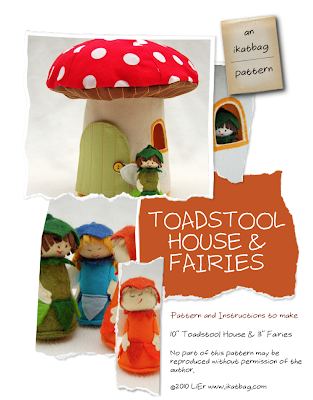 I am happy to say that the Toadstool House & Fairies pattern is finally available for purchase. Read the story behind the pattern in the original post here. It has been a long journey -longer than I thought - to get it from my sewing table to yours. I am grateful for all the feedback and photos from my beta-stage pattern testers, as well as the actual work they put in to sewing the fairies and toadstools. The vetting and checking are as complete as is humanly possible at this stage, but if there are any mistakes, please let me know and if I end up doing a review, I'll send you a free updated version ASAP. sewing around curves (there are very few straight seams in the House). working with stiffer fabrics like canvas, duckcloth and being confident to try out plastic canvas in a 3D construction. Also there is a lot of hand-stitching involved - I'd say a quarter to a third of the sewing of the House is done by hand, and this includes hand-basting to hold layers in place. If you hate hand-sewing, please don't buy this pattern. But if you don't mind sitting on the sofa after the kids are in bed, attaching bias tape with a neat little running stitch, you'll probably like it. The Toadstool House is the more challenging of the two projects in the pattern, of course. 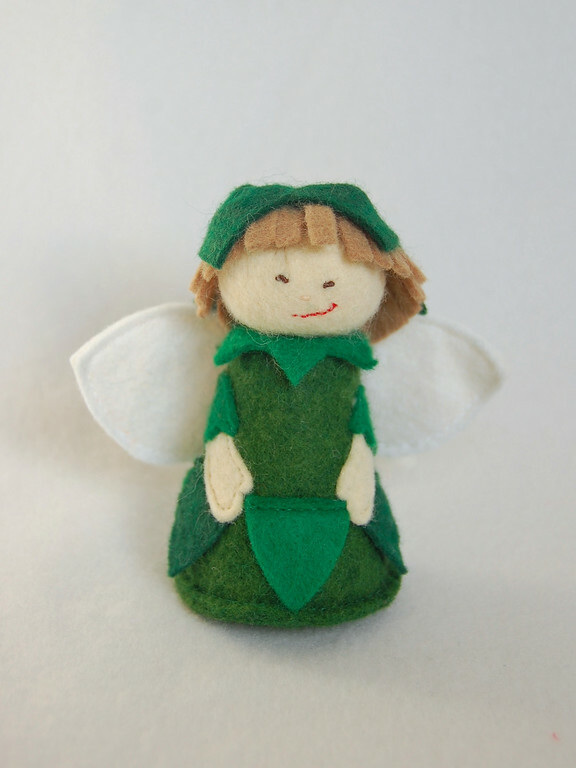 The fairies are much simpler - especially if you enjoy hand-sewing felt toys. I don't have the patience to hand-sew felt toys much, so I used the machine wherever I could. The pattern includes options to make the fairies by hand and by a combination of hand+machine that might just please most people. The pieces are small, but they stay put because felt isn't slippery. And because they are small, I would strongly recommend using at least a wool-blend, if not pure wool, felt. I buy mine by the 36"-wide yard at JoAnn. Depending on the percentage of wool, they can cost from $8/yd upwards. Use coupons when you can and know that even a quarter yard goes a long, long way with tiny felt toy pieces. Colors are limited in the store- the JoAnn store I patronize has only the colors that you might find in food. Here are some online felt stores that I know of - I haven't actually bought felt from them because I still have a deliciously large stash inherited from Grandma. and they sell 9" x 12" pieces in a wide variety of colors. A familiar staple if you are into cross-stitch and yarn weaving. I buy mine from JoAnn (again) and it comes in sheets of different sizes, mesh size and stiffness. The mesh size is unimportant unless you want the leftovers for cross-stitch. I wouldn't recommend the ultra-stiff (as said on the label!) variety - the regular stiffness (nothing said on the label) is sufficient. You'll need a single 13" x 22" sheet for the whole project or a 12"x 18" plus a 8.5" x 11" sheet. They cost between 99c and $2 per sheet. Or you could buy them online at JoAnn's online store here. These are the things that people put in the bottoms and appendages of dolls and beanie toys to make them sit squarely. You can easily substitute small beans, but I am always paranoid that some child in my house will gnaw on a toy containing said beans and cause them to germinate. Bad case of Science Mother Gone Mad, but there you are. Poly beads are inert, as far as I know, and can be bought by the bag at craft stores like Michaels and (I imagine) Hobby Lobby and JoAnn. A small bag costs about $8 and lasts forever. I am not affiliated to any of these stores, incidentally - I'm just telling you where I shop. One, at the request of some readers, you can now find all my patterns on the last tab "Patterns For Sale" under the blog banner. Each pattern is listed along with the sort of sewing skills you might need to be more comfortable tackling it, and a link to the original story post so you can see more photos and read a little more before deciding if you want to make it. I've put it in the shop if anyone would like to buy rather than sew one. 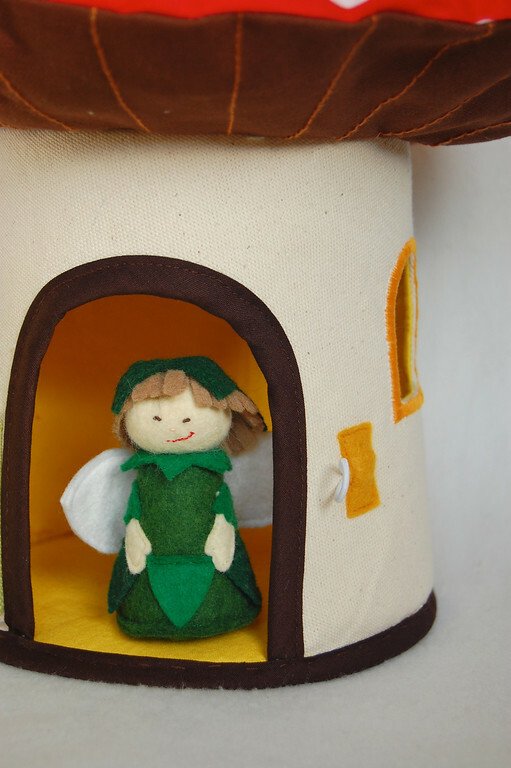 I am not planning to make more Toadstool House-Fairies for sale - I love them but I want to move on to other projects. Go here to buy the pattern and read the download instructions. 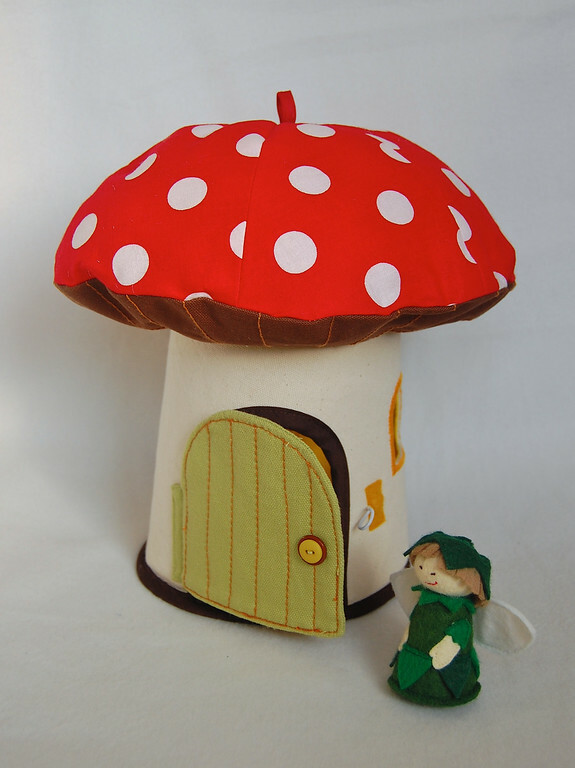 For the limited-edition ready-to-ship Toadstool House and Fairy Occupant, go to the shop. My wonderful pattern testers, and patient, patient Joy, who won this pattern in my giveaway last century, I'll be emailing you with your free patterns. Thank you, everyone, for your interest and support! Forget the fancy dishes, silverware and family heirlooms - I want to inherit a large stash of wool felt! I like how your fairy somehow resembles your daughters... Very sweet ! Laura: Definitely better than silverware! There is something bittersweet about cutting into grandma's felt collection. Some of the pieces still have shapes left behind from when SHE cut out stuff to sew toys for church sales and other such things. Some I remember, and some I wonder about: like, what did she make from this little scalloped thing here? Natacha: Really? I never thought of it. Impish, maybe! Moro no Brasil e adoro seu blog, amo seus trabalhos, acho todos lindos. Parabéns eu adorei a casa das fadas quero ver se faço um para minha filha.